Charles & James McIntosh et al, Toronto, ONT. Two 50hp engines, Sheldon, Dutcher & Co., York, ONT, 1833. 22' diameter wheels. 1833 Ran Prescott - Niagara, ONT. 1835, Aug 6 Grounded near Brockville, ONT, St. Lawrence River. 1834 Both owners died aboard of cholera. 1834, Nov New boilers installed, general overhaul, engines improved. 1837, Oct 26 Aground on sand bar at Ferris Point, 8 miles from Kingston, ONT. 1838 - 39 Chartered by Canadian Government durning the Patriot War; given armament of several cannons; patrolled Lake Ontario & St. Lawrence River shore. 1838, Nov 13 Participated in Battle of the Windmill near Preston, ONT. 1840 Advertised for sale; repaired, boiler improvements. 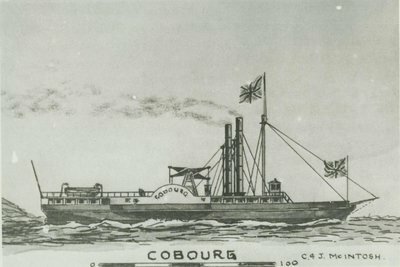 1841, Feb 1 To be sold at public auction, Toronto, ONT; purchased by W.L. Perkins? 1841, Aug Ran Kingston - Toronto. 1844 Listed as "laid up". 1845 Listed as employed on Lake Ontario & Rideau Canal; owned Donald Bethune.